Even if you’re comfortable with the iPad 2’s on-screen keyboard and can happily tap out a status update or quick email, you might not want to use it for tasks like writing a lengthy report. One option is to ditch the tablet for a full-fledged laptop — but it might be just as easy to add a wireless Bluetooth keyboard to the iPad. The ideal wireless keyboard would offer a full-keyboard typing feel while still being light and compact, making it easy to carry. Unfortunately, that’s a little like asking for a 25-in. monitor with brilliant display, light weight and low cost — chances are, you’ll need to compromise somewhere. Which features you’re willing to budge on depends on personal preference, but in any case, it makes little sense to get an iPad keyboard that’s no better than the on-screen version or that’s so bulky that it makes travel with the iPad no better than lugging a laptop. After that, your preferences will likely vary considerably depending on whether you are an accomplished touch typist or use just a couple of fingers to pound the keys. I got my hands on five portable wireless keyboards for the iPad 2, judging them on several factors likely to be important to a mobile user. For mobility, I considered weight, form factor and how easy it was to carry around (all but one of these keyboards fit around the iPad 2 to form a single unit; only Apple’s wireless keyboard remains a separate unit). With keyboard function, I judged how the keys felt and how they responded. And, in ergonomics, I considered how it felt to actually use the system. Did it feel cramped? Could I use it in a comfortable position? At first glance, the Apple Wireless Keyboard doesn’t seem like much of a mobile option. At 11.1 in., it’s quite a bit longer than the iPad, increasing the traveling form factor significantly. However, the keyboard is lighter than it looks. With an affordable keyboard case (I like the $15 model from Waterfield Designs), I can easily pop it into my backpack when on the road. Two pieces can sometimes even be a plus while traveling, allowing you to use the iPad as a conventional tablet while in the plane, with keyboard packed away, and then more like a laptop once you reach your hotel. Setup is a breeze, and the ergonomics are excellent. There’s a reason this feels close to a standard keyboard: It is one (except that it’s missing the number pad and three normally unused function keys). Keys are spaced for conventional touch typing and are responsive to the touch: not too stiff to require pounding, but not so soft as to produce letters while fingers are just resting. Note that this keyboard is powered by two AA batteries, while the other keyboards reviewed here recharge via a USB connection. This is also the only one among the group that was not designed specifically for use with an iPad. However, if you’re looking for something that lets you use the iPad for more serious content creation while you’re home — or if you’re traveling where size isn’t an issue (for example, if you’re driving) and you’re willing to travel with two pieces instead of one — this is a good choice. Dimensions/Weight: 12.8 x 7.3 x 1.4 in./ 0.7 lb. Best for: Touch typists who are less concerned about packing efficiency than typing comfort. The Belkin Keyboard Folio for iPad 2 was by far my favourite keyboard/case combo for actual typing. At 9.1 x 1.1 x 11.9 in. and 1.7 lb., the Folio isn’t a full-size keyboard, but its layout is close enough that I could touch type on it almost as quickly as on the Apple wireless. When Belkin claims this offers “well-spaced TruType keys for comfortable typing,” it’s not kidding. Pairing the keyboard with the iPad took about five seconds. It took a bit longer to figure out how to unfold the keyboard and get the iPad properly set up with it (the unit came with a six-step diagram that should have made the process clear, but didn’t). 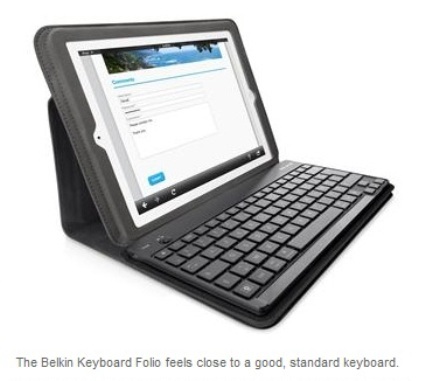 In addition to the iPad holder, keyboard and cover fold-out sections, Belkin has included a flap that folds under the keyboard when it’s being used to make the whole setup more secure. It also makes the iPad’s screen angle adjustable — you move the bottom of the screen along various indented areas in the flap to change angles. I didn’t feel the need to brace the screen either with something behind it or with my hand when tapping the screen, as I do with some other stands. However, while the Belkin portfolio isn’t bulky to carry around, it’s not something I’d enjoy using for non-keyboard use. I prefer my iPad to have its original, slim form factor when I don’t need the keyboard, and it turned out to be a bit of a pain to pull the tablet in and out of the Folio — there’s a snug fit, and the holder’s backing material tends to keep it in place. Also, for all its multiple flaps, the cover doesn’t close securely over the iPad screen, an odd oversight for something meant for travel. On the plus side, I’m pretty picky about how keys feel, and the Belkin Keyboard Folio is surprisingly close to a good, standard keyboard. This is a keyboard I could easily see using for several days of writing on the road. This may be the best combination of tote-ability and type-ability of the bunch — with the caveat that it’s somewhat inconvenient for switching between keyboard and non-keyboard use unless you want to always keep it in the portfolio. Dimensions/Weight: 9.1 x 1.1 x 11.9 in. / 1.7 lb. Best for: People who want a typing experience close to a full-sized keyboard with the portability of a iPad-sized keyboard/case combination. Years ago, I had a portable folding keyboard for a Palm PDA; in a couple of steps, it unfolded from a PDA-size enclosure to a full-size keyboard and dock. The recently announced Logitech Fold-Up does something similar. 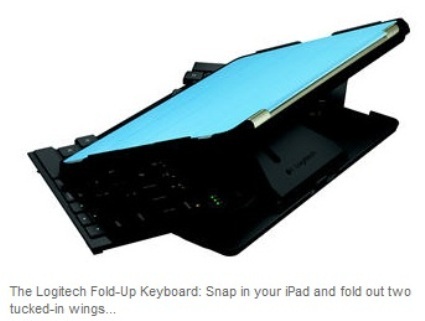 Snap in your iPad and fold out two tucked-in wings, and you’ve got an attached, full-size keyboard with iPad stand. The Fold-Up Keyboard is a well-thought-out design, with some nice touches — for example, the keyboard turns itself on and off when popped out or folded back up. It’s also easier to pop the iPad in and out of than the Belkin Keyboard Folio. The Logitech keyboard/case combo snaps together with the iPad at the back of the tablet, but it doesn’t offer a cover to protect the iPad screen. Instead, it’s designed to accommodate the Apple iPad Smart Cover that snaps on and off magnetically. If you already have one of those covers and like the way it safeguards the front of the tablet and automatically turns the iPad on and off when you raise and lower it, you won’t have to give that up. If you don’t have one, you’ll need to come up with something to protect the front of your iPad if you plan to use this as a travel case for your tablet. Like the Apple Wireless keyboard, the Fold-Up is a true full-size Bluetooth keyboard. However, the feel of the two are rather different. While Apple’s is a conventional wireless keyboard (except for a few missing keys), you’ll know you’re typing on a portable accessory when using the Fold-Up. To shave weight, the Fold-Up has been given a nonmetallic base, and I found that even moderately robust typing caused the keyboard to bend and flex. This was a bit disconcerting for a touch typist, since the two sides of the keyboard flexed at different angles and times. On the other hand, compared with many portable options, the keys’ full size and spacing make typing a lot easier for those whose finger memory is used to a standard keyboard. And the Fold-Up’s iPad holder seemed quite secure despite the reasonable 1.1 lb. weight of the overall package — about 8 oz. heavier than the full-size Apple wireless keyboard. For that extra weight, the Fold-Up offers a more secure stand than Apple’s iPad Smart Cover (although the viewing angle is not adjustable). The Logitech Fold-Up Keyboard could be a welcome tradeoff for frequent travelers who would happily give up the firm feel of a desktop keyboard in exchange for the Fold-Up’s convenient one-piece form factor. Just keep in mind that the single-unit tablet-and-keyboard iPad will be a pound heavier than the iPad alone, and you’ll be paying roughly $60 more than you would for the unfoldable Apple keyboard. Dimensions/Weight: 9.8 x 0.8 x 7.7 in. / 1.1 lb. Best for: Those who want an easy-to-carry full-size keyboard folded into a one-piece form factor and don’t mind a little extra weight. Logitech’s Keyboard Case is a metallic, iPad-size keyboard that, when not in use, snaps onto the front of your tablet to protect the screen for carrying around; it detaches for use as a keyboard and includes a groove for doubling as a tablet holder. The Keyboard Case is well designed for portability. You can rest the iPad in the keyboard’s central groove in either portrait or landscape mode, giving it almost a netbook feel. I preferred to have something behind the tablet when it was in landscape mode, though, since the center of gravity seemed a bit too high for comfort, making me feel as if it might tip backwards. The keyboard case has a high metal ridge around more than three-quarters of it, limiting where I could rest my hands. That may not an issue for you if you type with two fingers or use an unorthodox hunt-and-peck method. But if you rest your hands in the classic QWERTY keyboard touch-typing position, you’re likely to find your hands feeling a bit cramped. After fiddling a bit, I found that placing the keyboard on top of a thin paperback on my keyboard tray gave me enough wrist support to type with a fair amount of comfort. 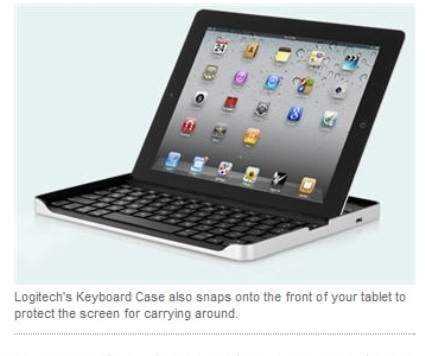 It’s not as easy to snap the iPad in and out of this case as Logitech’s newer and pricier Foldout Keyboard. Pushing the iPad in was easy enough, but prying it out again got me a little nervous at first. 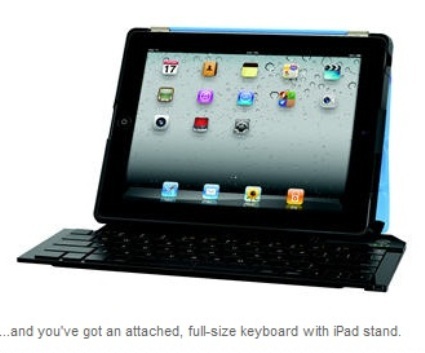 “Place the iPad 2/Keyboard Case vertically on a non-slip surface,” the instructions advise. “Place one hand on each side of the Keyboard Case, securing the Keyboard Case with one thumb and the iPad 2 with your other thumb. Apply slight downward pressure to the iPad 2 and separate the Keyboard Case from the iPad 2.” I did eventually get used to it, but I’m still not sure how that would work on an airplane tray table. The keys themselves have a nice feel — soft enough to not require pounding, yet offering enough physical feedback when pressed. If the keyboard itself didn’t have to be so restricted in size, it would be close to ideal. Dimensions/Weight: 9.7 x 7.5 x 43 in. / 0.8 lb. Best for: Typists who want a convenient mobile keyboard and don’t mind a metallic case. Solid Line Products’ combined case and rubberized keyboard is a portfolio that opens up to include both iPad holder and keyboard. Because it’s leather and not metal, it feels as if it should be lighter than the Logitech and Apple keyboards, but actually isn’t. 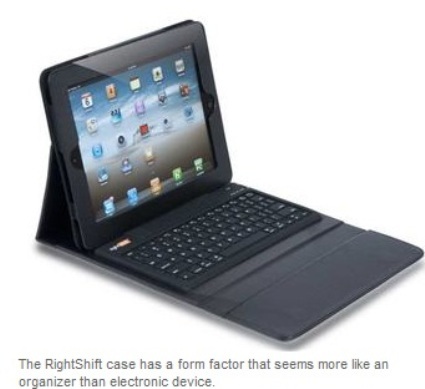 However, the RightShift case is still convenient for taking the iPad onto a plane or into a meeting, with a form factor that seems more like an organizer than electronic device. That may have particular appeal for those who want to hand-carry their tablet someplace without advertising that they’re walking around with a $600 electronic device. Unfortunately, the rubberized keys required me to make the most adjustments to my usual typing style. I felt I needed to type more deliberately and not as quickly as I might with a more conventional setup. I had several unwanted repeat letters (and spaces) as I was using this keyboard, as well as some letters that didn’t print when I tapped them. And of course it has the same issue as any other keyboard/iPad cover — smaller than full-size real estate. I had better results with this keyboard when switching from touch typing to two-finger hunt and peck, which slowed down my typing considerably — although it was still faster than using the on-screen keyboard. I also felt the need to hold the iPad with one hand whenever I needed to tap or swipe the screen, since the way the iPad stands up in the portfolio case feels secure for viewing but not when touching the screen. Dimensions/Weight: 9.7 x 8.0 x 1.0 in. / 1.0 lb. Best for: Slower, hunt-and-peck typists who value a folding portfolio form factor. Each of these units has pluses and minuses, so your choice should come down to which factors are most important to you — and where you’re willing to compromise. Since keyboard feel and relative light weight are my two biggest concerns, I ended up buying an Apple Wireless Keyboard, even though it’s not quite as convenient to carry around as most of the others. If traveling with two separate pieces is a non-starter for you, and keyboard feel and ergonomics are still important, consider the Belkin Folio, which had the best feel of all of the less-than-full-size keyboards I tested. However, keep in mind that it adds more than a pound and a half to your iPad — in fact, it weighs more than the iPad 2 itself. Finally, if only a full-size keyboard will do and you also want to tote it in a single unit with your iPad, you may want to look at the Logitech Fold-Up — if you don’t mind a pound or so of added weight, a higher price tag and a somewhat flexible keyboard base. Sharon Machlis is online managing editor at Computerworld. Her e-mail address issmachlis@computerworld.com. You can follow her on Twitter @sharon000, on Facebook, onGoogle+ or by subscribing to her RSS feeds: articles | blogs .